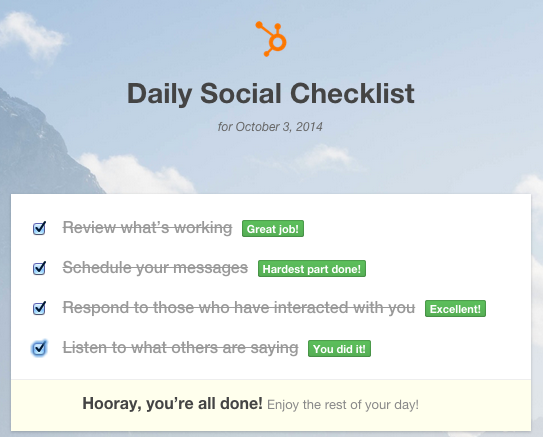 This is our tried-and-true daily checklist for making the most of your time on social media. Publish better messages and connect with more people, then move on to your day's other challenges. Review what’s working Use your best performing messages as a guide for future content. Publish at least three messages a day by scheduling a mix of your own and other's content. People expect a timely response when they interact with you or your published content. Take action when prospects and customers tweet questions, complaints, or praise. Following along as a HubSpot user? Make sure to connect all of your social accounts to HubSpot using our handy user guide before moving on. See what's resonating with your audience by spending at least 3 minutes reviewing your published messages. Use your best performing messages as a guide for future content. If you want to drive more people to your website, look at your messages with the most clicks, retweets, and shares. Haven't published anything yet? Inspect your followers' bios to see what types of messages they're favoriting or sharing. Now that you know what's working, spend at least 5 minutes scheduling your messages for the day. Provide positive customer reviews or testimonials. Close the loop by taking up at least 7 minutes to respond to those who have interacted with you. People expect a response when they interact with you or your messages. Keep your audience engaged by replying to or favoriting mentions and comments, following back genuine new followers, and thanking those who share your content. Listen to what's being said about you, your competitors, and more for at least 5 minutes. We know you have more on your plate than just social media. We also know how important it is to have a presence where your customers and prospects spend time. Use this checklist to get the most out of the little time you have. 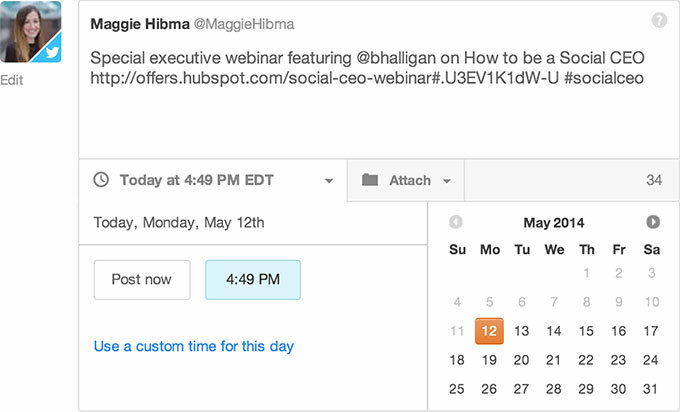 We even created a handy Chrome extension for HubSpot customers that checks off your to-do's for you as you complete them in Social Inbox. Get it here. Do more with the time you have. All of this can be done without Social Inbox, but we wouldn't recommend it. Try it out free for 30 days to see how much time it can save you when publishing content, connecting with your audience, and finding new prospects. To help you get started with Social Inbox, check out our Social Media user guide or watch our training classes on Social Inbox and social media.